Match any of YOUR NUMBERS to any of the WINNING NUMBERS, win PRIZE shown for that number. Get a "TRAIN" symbol, win DOUBLE the PRIZE shown for that symbol! 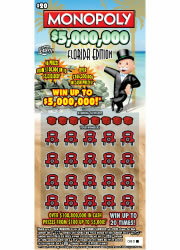 Get a "CAR" symbol, win 5 TIMES the PRIZE"GO" symbol, win $200 automatically! Get a "HAT" symbol, win 10 TIMES the PRIZE shown for that symbol! Get a "MONEYBAG" symbol, win all 20 PRIZES shown!